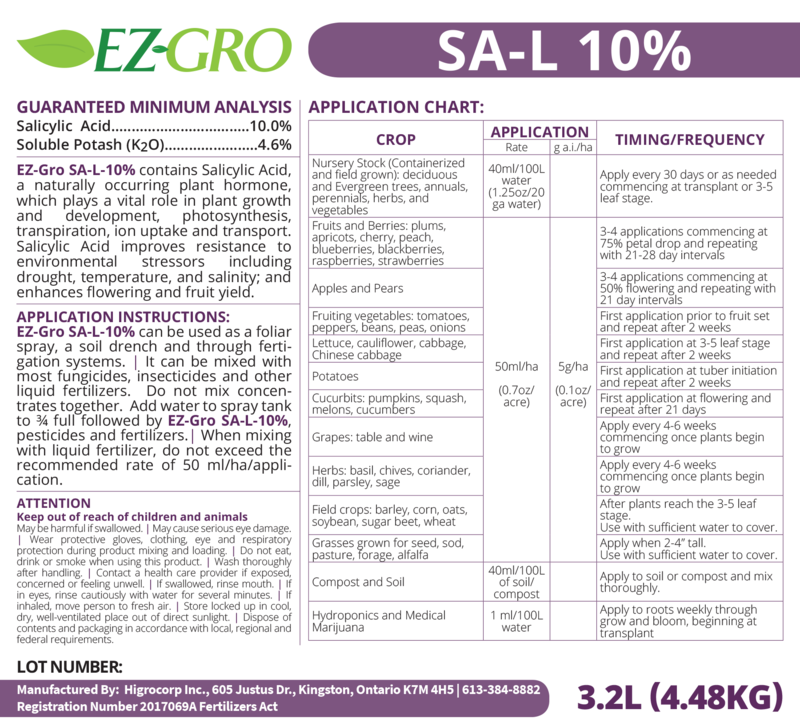 EZ-Gro SA-L 10% contains Salicylic Acid, a naturally occurring plant hormone, which plays a vital role in plant growth and development, photosynthesis, transpiration, ion uptake and transport. Salicylic Acid improves resistance to drought and environmental stress, enhances hardiness, flowering and fruit yield, and aids in Systemic Acquired Resistance (SAR). Apply EZ-Gro SA-L 10% liquid to your crops to protect against abiotic stress and improve overall quality and yield. • Salicylic Acid is an endogenous signaling molecule associated with various defense mechanisms native to plants. • Salicylic Acid is known to protect against drought and salinity, as well as heavy metal toxicity and extreme heat. • Often referred to as a “therapeutic agent” for crops, Salicylic Acid is important throughout the entire plant lifecycle.